This is Ottoman calligraphy on the fabric covering of a sarcophagus at the Sultan Mahmud II Türbe in Sultanahmet. The mausoleum was built in 1840 and houses several family members. Here are some views of the türbe and attached cemetery. Mahmud II, a political reformer, was Sultan of the Ottoman Empire from 1808-39. The Sea of Marmara as seen from the Küçük Ayasofya neighborhood in Fatih. Some of these ships are probably waiting their turn to navigate the challenging Bosphorus. For details about how treacherous this can be, here is information about navigating your yacht through the straights. Here is a fairly close shot of the mosaic detail in one of the domes of the inner narthex at the Chora Church (museum). The original church, built in the 5th century, survived a number of disasters, both natural and man-made. The Byzantine mosaics date from the early 14th century. More about the church here. This is a close-up of tiles found on the exterior wall of an apartment building on the far edge of the Fatih district, roughly here. This is very close to the northern end of the old city wall. This dome is in the Tiled Kiosk at the Istanbul Archeology Museum(s). This kiosk was built as a garden pavilion by Mehmet II in 1472, and now holds displays of tiles and pottery. Mehmet II is the guy who conquered Constantinople – at the age of 21 – laying to rest the Byzantine Empire. These faces (only 1600 years old) are on the pedestal of the Obelisk of Theodosius, so named because Roman Emperor Theodosius I (re)moved it from Egypt in the late 4th century, and placed it in the Hippodrome. The obelisk itself originates from the Temple of Karnak, 15th century BCE, and is also referred to as the Obelisk of Thutmose III. The obelisk is in much better condition than the pedestal, in spite of being 3500 years old. These birds were making a racket at dusk in Gülhane Park. The culprit is the Küçük Karga which translates as “little crow.” Also known as the Eurasian Jackdaw (Corvus monedula), it is indeed a member of the crow family, and has a wide range distribution. The Mihrimah Sultan mosque in Edirnekapı (in the Fatih district) is one of two mosques built for the daughter of Süleyman the Magnificent. The other is in Üsküdar, on the Asian side of Istanbul. 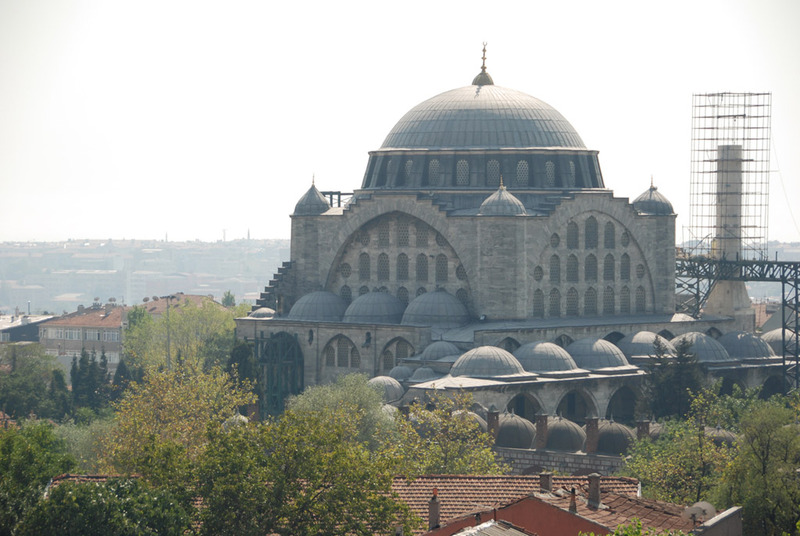 Both mosques were designed by Mimar Sinan, the master Ottoman architect. Note the large number of windows in this mosque. Read more in this earlier post. The exterior looks like this. This is the interior of the Fatih Camii. Constructed in the 1460s under Sultan Fatih Mehmet (the Conqueror), it was built on the highest hill of what was Istanbul at the time. It was built over the site of the Church of the Holy Apostles (built by Emperor Constantine in the 4th Century), which eventually was plundered during the Crusades. Constantine intended this church to house relics of each of the twelve apostles, as well as his own tomb, but I digress. The crumbling church had been abandoned by the time it was razed for the construction of the mosque. The mosque’s complex (kulliye) included tombs, schools, a hospital, a kitchen for feeding the poor, a library, a hospice, a hamam, and a market. Here’s where it is in Istanbul. Here’s the exterior. This is a bit of the Friday (Cuma) service at the Fatih Mosque. It was recorded in the courtyard, from loudspeakers. Copyright © 2019 The Bosphorus Bystander. Powered by WordPress and Alétheia.